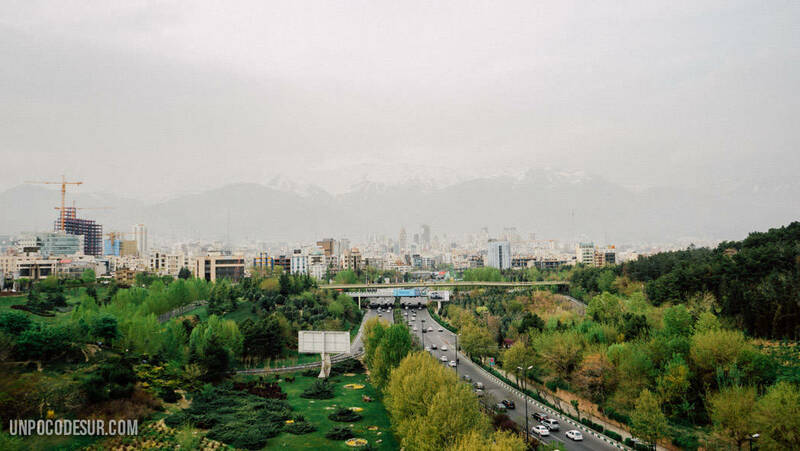 The vast majority of travellers will begin their way through Iran in Tehran, at least in case of having arrived by plane (one of the ways to get the visa upon arrival). Many even try to avoid the city at all costs and try to land elsewhere. 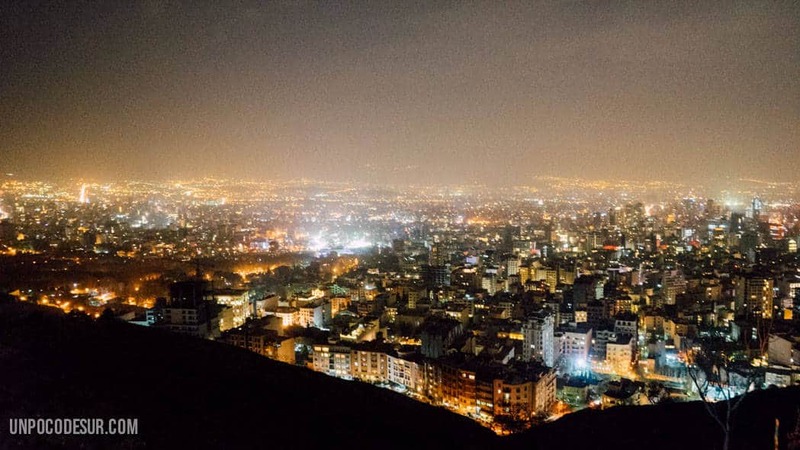 It’s understandable, Tehran is a chaos, a very big one. 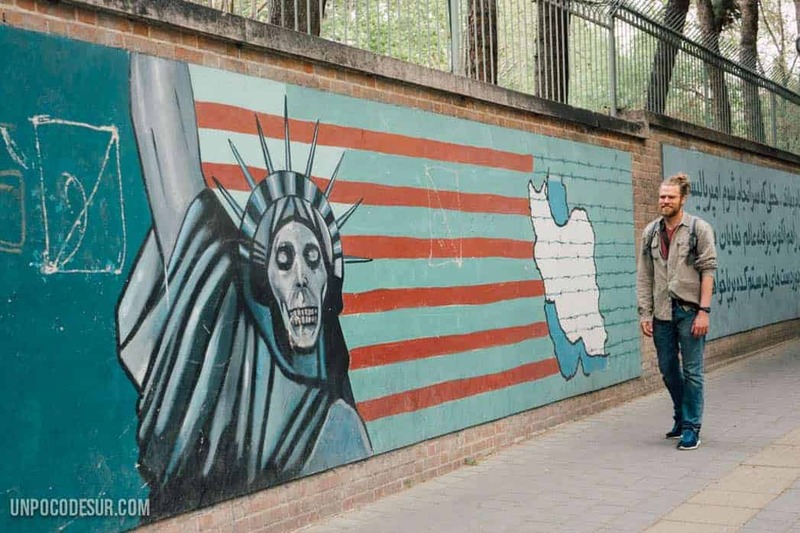 But we had no choice, the visa procedure to India had to be done in Tehran so we ended up living it much longer than we imagined. 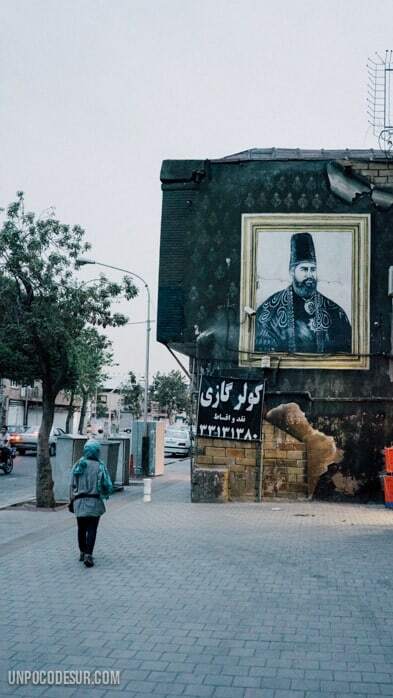 There is a not lot to see in Tehran, the reality is that if you do it without a local many of the city secrets will pass completely unnoticed, so in any case we recommend you to get someone via Couchsurfing, no need to stay at their place, you can sleep in a hotel or hostel, but having someone in the city will always make it much more friendly and you may visit places that otherwise you wouldn’t have known. The magnetic card (Like an Oyster card form London): In which a desired amount of credit will be charged and you have to pass it before and after leaving the station. Loose tickets: If you don’t want to complicate it you can always use the option of loose tickets, there is the ticket for a single journey and a return ticket (14.000 and 21.000 RS respectively in 2017). They are not expensive but with them, you will simply pay the whole trip no matter how many stops you made in the system. Compartments for only women cannot be used by men (they are located at the head and tail of the train), but contrary to what urban legends say, mixed can be used by women. It is not very common to see them and even less if they are alone, but it is another of the ways they have to call out segregation, so we encourage you to do it. Honestly, I never felt insecure in one of them. Peak hours are really peak. That means taking a subway at 8 AM or 5 pm can be a pain. If what you spare is time then wait for a couple of trains to not have to see you packed like a sardine. Pay attention to the metro map, some stations change the name but some of the maps are not always updated. 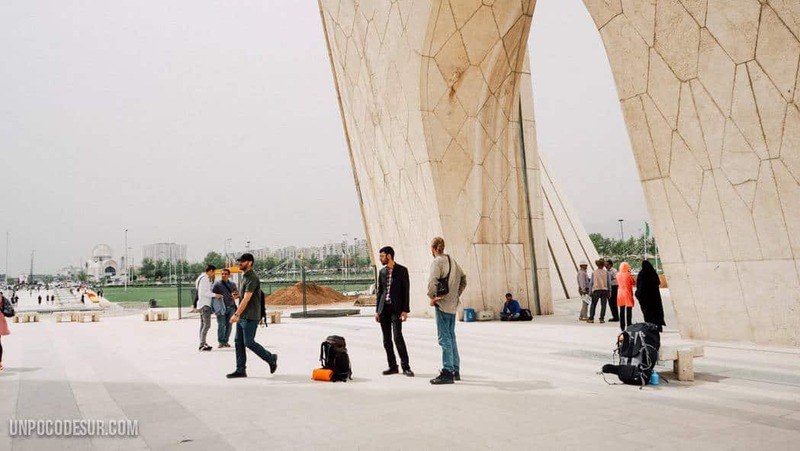 For example, the Azadi tower station was previously called just AZADI, now it’s called something else. In a large number of stations, you will find it with the old name. If you haven’t met a local (which is strange) then we leave you here with a list of places that can be more interesting to visit. I wouldn’t be surprised if Tehran’s Bazaar was one of the biggest or the biggest market in the world. It covers more than 10 kilometres in length and it is possible to get lost for hours (while finding all kinds of gadgets) a perfect place to let time pass. Don’t miss the carpet section! We were not the palace people, but it is one of the most recognized tourist attractions in the city. We do know someone who has visited it and you can find all the information here. We don’t know the way to get here with public transport, but I’m sure there’s some (by the way if you discover it we appreciate you help us keep this post updated). On the terrace what you will have are great views of the city, both day and night. Like other great cities like Tokyo or Berlin, Tehran has its own communications tower marking the city’s horizon. It is possible to climb to the top but a little bit nonsense since it costs 500.000 RS, something we decided not to invest in, especially after our 500€ loss. If you visit it we would appreciate your opinion. Torcal marks the landscape of the city from the first moment, with a little bit of luck and little smog you can see it imposing, still white, at the end line of the city. It is very common for locals to go for a couple of days to Torcal, you can do it via local buses from the Azadi station, or with your own means of transport. In the mountain, there are free use cabins for walkers. Remember that Fridays are Sundays, many buses do not take the tour that day. While we were a few days around the city we didn’t try different accommodation options, you know, a bird in the hand is worth two in the bush. Price: 250.000 Rs per person on a shared room (500.000 Rs for a double room) in April 2017. 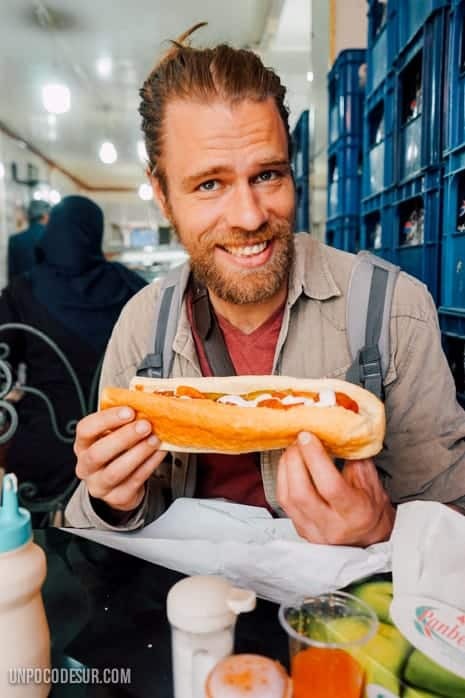 Eating in Tehran is relatively cheap but the options (unless you visit a traditional restaurant) are limited. 90 % of food is limited to kebab (with rice or without it) and falafel. There are thousands of small shops with falafel from 25.000 to 50.000 Rs, many are “Self-service” with certain ingredients that you stuff in the bun at your taste. The truth is that it is a very cheap, vegetarian and easy option to get for the days of little budget or little desire to worry. On the other hand, the kebab can be found in more established restaurants and usually come accompanied by rice onion or tomato and bread. 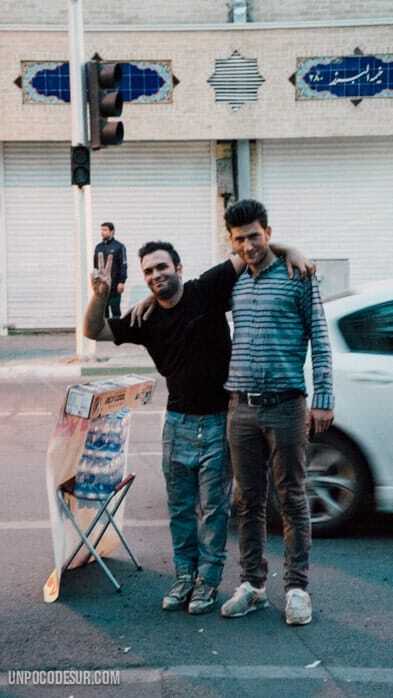 Change money on the Ferdowsi street and don’t do it on the street as such (if it’s very early when you arrive wait until the stores are open). Change in stores will be better than the ones outside. If you need to buy gas for the stove or any type of camping equipment (forget about the tents, here’s another story) next to the German Embassy (near the Ferdowsi street) there are some hunting shops. If you need to make photocopies look for a photographer (sounds weird, but that’s right), sometimes in insurance offices or similar you will do but in case of doubt, ask for a photographer.